At the Greek Parliament: Maria Sotiropoulou of International Physicians for the Prevention of Nuclear War, Tony Simpson, Alexis Tsipras, and Panos Trigazis of SYNASPISMOS. 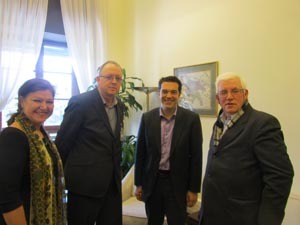 Inside the Parliament, I met with Alexis Tsipras, the 38-year-old leader of SYNASPISMOS, part of the SYRIZA Coalition of the Left, which is attracting support from increasing numbers of Greek voters, as the general election on 6 May clearly showed. SYRIZA won almost 17% of the vote, up more than 12 percentage points since 2009 when it polled 4.6%. Now it has 52 MPs, four times more than previously. This vote put SYRIZA within just 2% of the Conservatives, New Democracy, the largest party. Under the Greek electoral system, the largest party automatically receives an additional 50 seats, so New Democracy, although its vote declined by 14 percentage points on Sunday, now has 108 Members of Parliament, an increase of 17 since 2009! This 50 seat ‘bonus’ masks the sharp decline of the Conservatives who, having lost the 2009 election with 33.5% of the vote, have now lost a further two-fifths of their voters. A large part of the Conservative loss (10.5% of the vote) went to the Independent Greeks, a new party on the democratic right, which campaigned on a staunchly anti-IMF platform. PASOK, the Socialist party, saw its vote decline by 30 percentage points (from 43.9% in 2009 to 13.2%) and its Parliamentary representation shrink from 160 to 41. The KKE Communist Party’s vote rose slightly to 8.5%, adding five more MPs to make a Parliamentary Group of 26. The new Democratic Left party, which split from SYRIZA in 2009 and absorbed some of PASOK’s recent losses, won 6% of the vote and 19 seats. Several smaller parties, including the Greens and the Social Contract (a splinter from PASOK, on similar lines to the Independent Greeks’ splinter from New Democracy) collectively received some 19% of the popular vote, but individually received insufficient support to cross the 3% threshold required to enter the Parliament. The nationalist LAOS (5.6% in 2009) also dropped to 2.9% and failed to win representation, while Golden Dawn, an anti-immigration fascistic party, polled almost 7%, gaining 21 seats as it entered Parliament for the first time. Turnout was about 65%, so that one in three electors didn’t cast a ballot. This drop in voter participation is partly attributed to economic difficulties which prevent the poorest voters from travelling from larger population centres to their own towns to vote. Prior to the election, SYRIZA consistently emphasised that the previous Greek Parliament no longer had the legitimacy to approve legislation imposed as part of the austerity programme, particularly after the removal of PASOK Prime Minister George Papandreou and his replacement by the unelected Lucas Papademos. The laws in question included those lowering salaries and the minimum wage, and abolishing collective agreements between trade unions and employers. Parliament failed to represent the will of the people in voting for such legislation, which would demolish social gains achieved over decades. In fact, some PASOK and New Democracy Members refused to vote for the punitive austerity measures brought before them by Mr Papademos at the behest of the International Monetary Fund, the European Central Bank, and the European Commission, the so-called ‘Troika’. Mr Papademos is himself a member of the influential Trilateral Commission (like Mario Monti, appointed about the same time as Prime Minister of Italy) and was formerly a Vice President of the European Central Bank. He replaced Prime Minister George Papandreou of PASOK, in November 2011, seemingly at the behest of Mrs Merkel and others. ‘The bailout is for the bankers,’ Mr Tsipras confirmed at our meeting in March. Not a euro is for the people. On the contrary, the majority of Greece’s eleven million citizens are expected to swallow bigger and bigger cuts in their living standards, although they are already amongst the poorest in the European Union. Greece constitutes about 2.5 per cent of the European economy. With Ireland, its output is amongst the smallest of the Eurozone group, and shrinking year on year so that its debt to GDP ratio becomes increasingly unsustainable as output falls and unemployment rises. The ‘treatment’ is killing the patient. The debt crisis is a European crisis, which is at its most acute in Greece. In response, Chancellor Merkel of Germany, with some help from Mr Sarkozy, the defeated French President, has pushed through the European Fiscal Compact, which looks increasingly unlikely to be ratified by all 25 signatories. (The UK and Czech Republic did not sign.) But only 12 ratifications are necessary for the Compact to take effect. The Austerity Treaty, as the Fiscal Compact is known in Ireland, is supposed to enforce fiscal discipline and balanced budgets. In so doing, it will drive down economic activity even further, at a time of low or non-existent growth, raising the prospect of a deep slump spreading across the European Continent. Meanwhile, Ireland will hold a referendum on the Austerity Treaty on 31 May. The “no” vote is mustering sizeable support, with the Campaign for a Social Europe, Sinn Fein and others taking the initiative. Memories of the initial defeats of the Nice and Lisbon Treaties by the Irish electorate remain fresh. In Greece, Mr Tsipras is acknowledged as one of the most incisive critics of the severe austerity policies that were pushed through the Parliament there by previous governments. The second Memorandum of Understanding, signed by Mr Papademos and the Troika, commits Greece’s payments to bondholders via a Luxemburg account. Thus the so-called ‘bailout’ funds are circulated to international banks, without benefiting the Greek people. Greek national assets would apparently serve as collateral against non-payment. Tony Simpson is editor of The Spokesman journal of the Russell Foundation (www.spokesmanbooks.com). He was invited to Athens by the Byron League for Philhellenism and Culture on the occasion of the 200th anniversary of Lord Byron’s landmark maiden speech in the House of Lords in defence of the Luddites. With grateful acknowledgements to Theo Iliadis of The Paragraph for his help and guidance.